ANDICOR IS COMMITTED TO BEING CANADA’S RELIABLE SOURCE FOR INNOVATIVE SPECIALTY CHEMICALS AND RIGID PACKAGING SOLUTIONS. Since Andicor began in 2002, as a specialty chemical distributor, we have experienced steady growth with a dedicated team of industry experts, allowing us to expand into new market segments. We have built a portfolio of complementary product lines to improve the performance of our customer’s products. Andicor has also become the leading packaging product supplier in Canada. Focused on regulatory governance and environmental concerns, we work with our suppliers to effectively evolve with the changing landscape of the specialty chemical industry – always with a focus on its future. Centrally located in Mississauga, in southern Ontario, we maintain a national focus, accessible and accountable from coast to coast to coast. Our professional sales team are supported with a strategic warehousing network stocked with an extensive product inventory across all markets to exceed customer demand. We offer efficiency and expedited delivery above the industry standard. Andicor continues to grow in a controlled manner, building a portfolio of complementary product lines to improve the performance of our customers’ products and to meet the regulatory demands and environmental challenges of today’s rapidly evolving market. Andicor is committed to ensuring compliance with all government regulations. Our director of Regulatory Affairs is mandated to educate and update our team on issues that impact our industry. We adhere to the Responsible Distribution Canada’s Responsible Distribution:2013 Code of Practice, (RDC). 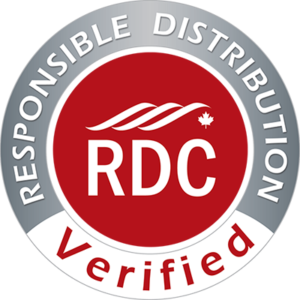 The RDC governs member company actions to meet the guiding principles as they relate to all aspects of the distribution of chemicals, chemical products, and chemical services. Please review Andicor’s Policy Statement to understand our commitment to the environment and to our employees.